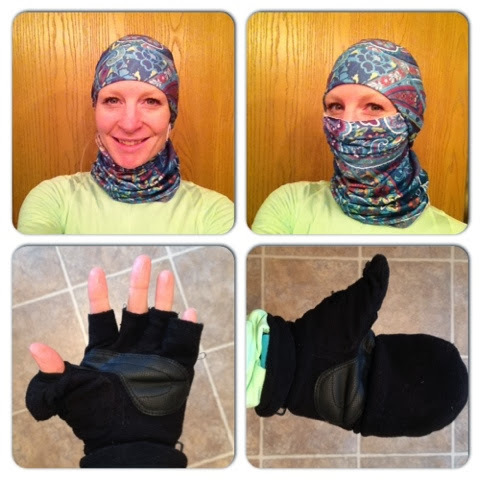 I have had a couple questions lately about what I wear to run in super cold temps. I consider super cold to be anything below 15 degrees, or anything under 25 if it is windy and or cloudy. The sun makes a huge difference. I will preface this by saying I hate to be cold. Sometimes I really have to talk myself through that first half mile till I finally start warming up. It does help to warm up before you leave the house, not to the point where you are dripping sweat, but getting warm in your running clothes. Here is how I layer. I start with compression socks because they are tall and provide extra coverage and protect from zipper rubbage from the tights. I hate cold thighs if it is windy so I double layer tights. I have a pair of UnderArmour Cold Gear 2 tights that go great underneath my fleece brushed running tights. Today, sadly, I am wearing a pair of tights I got at Costco since my UA tights are in the wash, but they work pretty good too. I have a pair from Saucony and Brooks that are both great. I think any brand would be fine. Their winter running tights are nice and thick. I also have a pair of warmup type pants that I wear sometimes but I don't like how loose they are around the calves so I don't usually wear them. If you care I my Brooks tights are the Utopia Thermal tights and I have the Utopia Thermal pants. Both super warm and comfy. Long sleeve technical cold weather shirt as a base layer. I love my Under Armour Cold Gear 2 shirt. I also found a great one at Target this year from their Champion C9 line that is a turtle neck. My go to running jacket is a Champion one I got at Costco several years ago. It is thick but not overly heavy. Today I am using my Swirlgear jacket because it's new and I want to. I also added an green Gap Fit half zip as a middle layer on top. It's cold out. Hat, neck warmer, and gloves with a mitten cover. I really like these because they allow for some temperature regulation. Getting hot, uncover the fingers. Cold..cover them up. Also the neck warmer can switch to a hat if I find I am getting hot and need my neck exposed. Neck warmer also doubles as a face cover if needed. Once again I really hate being cold so if I think my toes are going to freeze I use toe warmers. Hand warmers as needed and sometimes I even throw on an additional coat. Okay I use the extra coat a lot. I like to start my run with a quarter mile out and back to assess my layers. Usually after half a mile I am warmed up enough to decide if I want to keep the extra coat or ditch any of my layers. I recommend tucking your first layer of shirt into your tights to prevent cold air from getting to you. A simple thing that helps a lot. I prefer to over rather then under layer. I hate being cold. I admit I am a bit of a wuss about it, but I remember so many times freezing while working cows when I was a kid and it's so miserable, but ranch life does not pause just because you are cold! I haven't regretted many cold weather runs, only 1 where it was -40 with windchills and I ended up having to run backwards to prevent my eyes from freezing shut. I should have been wearing ski goggles maybe. Those are my artic weather dressing for running tips. Anyone want to add anything? I love any ideas on staying warm! Oh my gosh. As much as we're complaining about our 80 degree December days, here, I wouldn't trade that for your temps. I can't imagine going through that much work to go for a run! That having been said, I prefer to be a bit chilly, rather than too hot when I run. Wow you are well prepared! I hate being cold too. Those gloves are awesome! It's definitely key to tuck your base later into your tights! That can undermine your entire outfit otherwise! 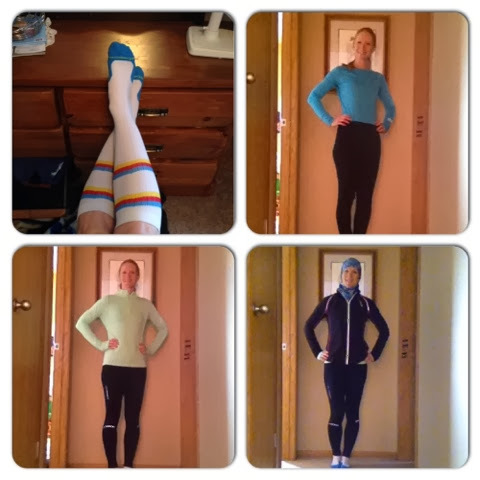 I don't like to be cold either and wore my compression socks on a recent run to keep me warmer. 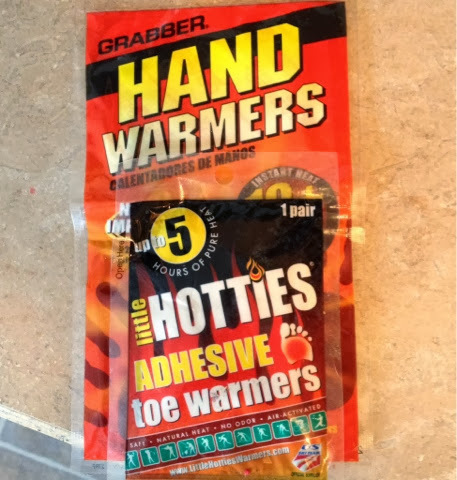 I like to use those hand warmers for cold race mornings. Thanks for the reminder to check Target's winter sports clothes! Oh tucking that base layer in is key!!! You are certainly prepared!! UGH I cannot bear to be overly warm. I love the Endurance Tight from Moving Comfort, the Brooks Utopia Thermal Pant, and Sugoi Subzero Zap Tight. On top I usually layer a sports bra, tank, long sleeve and vest, or long sleeve and jacket (depending on the epic coldness). I also have two pairs of gloves that I rotate between, Nike and Pearl Izumi, both with a windshield to cover your fingers or tuck back into it's own pocket on the hand. Thank you for this, because I am experiencing the first arctic temperatures in my life (like minus 10 degrees weather here in Kansas) and I have no idea how to dress. The cold I am used to is Southern :) So I end up either wearing too much or too little. Nice to hear what someone else wears in the cold. I have an easier time getting the top right than the bottom but will work on it. I have two Craft shirts to pick from that are fabulous as a baselayer under a warmer shirt, my Adidas running jacket or both. Definitely agree with tucking the shirt in! Helps so much. I haven't braved an outdoor run since Thanksgiving, but I'm so sick of the treadmill! yesyesyes on tucking the layers. Helps so much. Is that a Buff you're wearing? cute pattern!